(i) It helps to neutralize the demagnetizing effect of armature reaction. (ii) If wound for cumulative compounded machine the electrical performance will be improved. All armature conductors placed under the main poles region produces e.m.f which is at right angle (90°) to the main field e.m.f. This e.m.f causes distortion in main field flux. This is known as cross magnetizing effect. To minimize the cross magnetizing effect compensating winding is used. This compensating winding produces an m.m.f which opposes the m.m.f produced by armature conductors. This objective. is achieved by connecting compensating winding in series with armature winding. 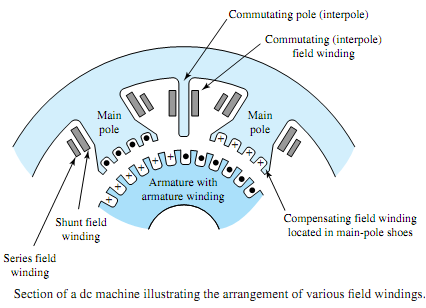 In absence of compensating winding, cross magnetizing effect causes sparking at the commutators and short circuiting the whole armature winding. This winding neutralizes the cross magnetizing effect due to armature conductors only but not due to interpolar region. This winding is used in large machine in which load is fluctuating. Cross magnetizing effect in interpolar region is by interpoles (also known as compoles (or) commutating poles). These interpoles are small in size and placed in between the main poles of yoke. 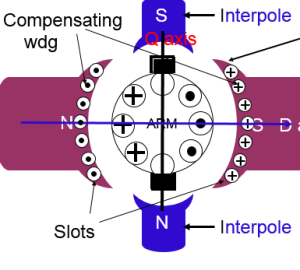 Like compensating winding, interpoles are also connected in series with armature winding such that the m.m.f produced by them opposes the m.m.f produced by armature conductor in interpolar region. In generators, the interpole polarity is same as that of main pole ahead such that they induce an e.m.f which is known as commutating or reversing e.m.f. This commutating e.m.f minimizes the reactance e.m.f and hence sparks or arcs are eliminated. Compensating winding and interpoles are used for same purpose but the difference between them is, interpoles produce e.m.f for neutralizing reactance e.m.f whereas compensating winding produces an m.m.f which opposes the m.m.f produced by conductors.